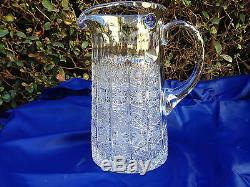 BOHEMIA QUEEN LACE HAND CUT 24% LEAD CRYSTAL PITCHER, 50 OZ APP. 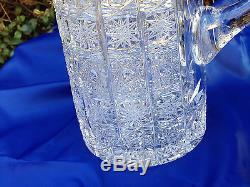 1.5 LITER, FROM CZECH REPUBLIC. 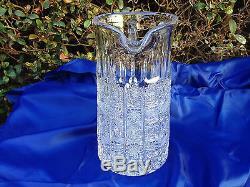 HEIGHT 9.5", BASE DIAMETER AT 5.3" (the diameter slightly narrows toward the top). 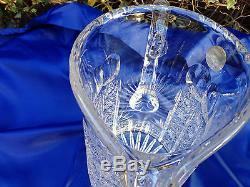 THIS IS CZECH REPUBLIC, BOHEMIA, FINEST 24% LEAD HAND CUT CRYSTAL. 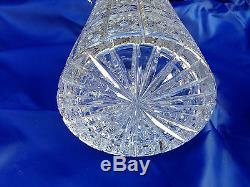 We have been in crystal business since 1984 based in Southern California. Your satisfaction with every item is 100% guaranteed. 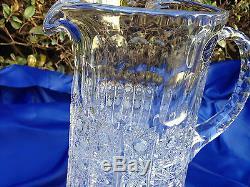 The item "BOHEMIA QUEEN LACE 24% LEAD HAND CUT CRYSTAL TALL PITCHER 50 OZ, 1.5 LITER NIB" is in sale since Saturday, February 20, 2016. 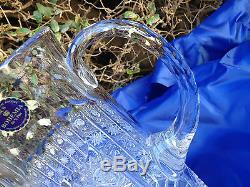 This item is in the category "Collectibles\Decorative Collectibles\Bowls".